born 1954 in New Jersey, enjoys a world-wide reputation as a musicologist. 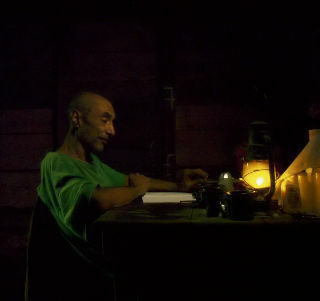 His vast life’s work includes more than 1.000 hours of recordings of unique songs and musical pieces that often have already disappeared in this form among the Bayaka. In college, he studied English and Literature and shared his passion for experimental music with his roommate Jim Jarmusch, whose later films Dead Man (1995) and Ghost Dog (1999) are partly inspired by Sarno´s exceptional life journey. Listening to the radio on a winter’s night in the middle of the 80s, Sarno came across a kind of music he had never heard before: “Those strange harmonies gave me goose bumps. They had a hypnotic effect on me–pure magic.” The music he heard on the radio captivated him. He did some research, found out that it was Pygmy music and, armed with only a tape recorder and the 500 dollars he had to his name, he boarded a plane to Bangui, the capital of the Central African Republic. He only had enough money for a one-way ticket.